After an apprenticeship supporting some of indie rock's finest flag bearers, including Morrissey, Kaiser Chiefs and the Courteeners, All the Young have now graduated to become a bona fide headliner in their own right. Last year saw the quartet release a clutch of singles as they played second fiddle to established acts but 2012 is an altogether different proposition. Tipped as one of XFM's 12 for 2012, All the Young have played eye-catching sets at SXSW 2012, released their debut album (this month's Welcome Home) and sold out a spring tour. And they've done all of this without forsaking their Potteries roots, frequently playing their hometown and finally giving Stoke-on-Trent ambassadors to rank alongside Robbie (and his mate) and Slash. With no prospect of the dust settling, Ryan and Jack Dooley and co have continue to lead a guitar-rock resurgence with a lengthy summer tour going on sale this week. The tour kicks off at the 100 Club in London on 28th May, followed by shows in Brighton, York, Leeds, Leicester, Edinburgh, Birmingham and more, before the final date announced so far at Esquires in Bedford on 29th June 2012. We will have tickets available from 9am on Friday 20th April, priced generally less than a tenner. 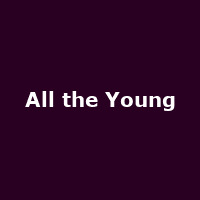 All the Young are also playing Dot to Dot 2012 dates in Bristol, Nottingham and Manchester on 2nd to 4th June and RockNess 2012 on 10th June. We have tickets for both festivals available now, priced £20 for Dot to Dot and starting at £64 for a RockNess day ticket.